Why oh why are my family so jolly difficult about orange vegetables? I know they are good eaters and I really shouldn’t complain but I love my beta-carotene and I wish they did too. Every now and again I try something new hoping it will be a winner. My current read is Animal, Vegetable, Miracle by Barbara Kingsolver which was recommended to me by Leslie. I’m so glad she did. It’s a wonderful exploration of eating locally and well worth reading by anyone who eats. It’s a little ironic, given the content, that I chose to make an out of season recipe from it this weekend. Eh, I never claimed to be perfect and I was really, really craving some orange. Whilst the family ate the sweet potato quesadillas, they didn’t love them. Which is a shame because I did love them. A great thing about this recipe is that it goes a long way. 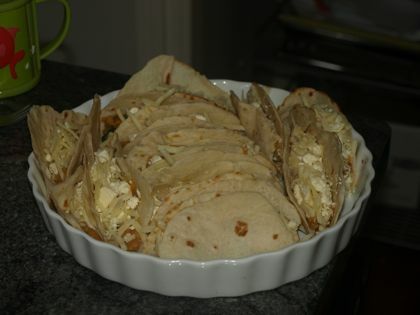 I managed to get dinner for the Bread Winner and I, lunch for the whole family and another lunch for the Ankle Biters out of 1 medium sweet potato, one batch of tortillas and half a kilo of cheese. That’s a total cost of $7.50 and 8 serves. Definitely a budget meal. I simplified the recipe a little in the thermomix. As for the ingredients, I omitted the basil, doubled the onion, garlic and cumin and used my usual cheese mix for Mexican type foods of 1/2 tasty and 1/2 feta. I only used 1 sweet potato as I didn’t want to push my luck. I added a small bunch of shredded silverbeet (chard). I chopped the onion and garlic in the thermomix and sauteed. Then I added the boiled sweet potato, shredded silverbeet and all the spices. I cooked that at 100 degrees for three minutes on speed 1. 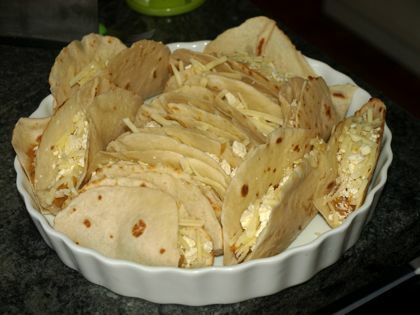 For dinner I spread some sweet potato mixture on a tortilla and covered it with cheese and topped it with another tortilla and continued the stacking until there were three layers of sweet potato and cheese. I baked ina hot oven until the cheese was melty and served with a dollop of sour cream. For lunch, I sprad the sweet potato, added cheese and folded the tortillas like soft tacos. Then baked until melty and served with sour cream. Either way, delicious. I’d wolf that lot down in a flash! My girl is a little the same with the orange veg thing, (strange considering she will beg for broccoli off our plates after she’s scoffed hers). She won’t touch roasted pumpkin or sweet potato, but will have it in soups. That’s about it though. You know, I’ve been meaning to read the Kingsolver for ages, and must get to it. I’ve heard it’s wonderful. Curse of the orange veg. Frustrating. Definitely red the Kingsolver, you’ll love it.